Quick heads up if you’re after Bac Bac Rainbow Version By Darylhochi x ToyZero Plus and don’t wanna pay the crazy aftermarket price. First making its debut at Toy Soul 2017 Bac Bac Rainbow Version quickly sold out at all 3 days but being a nice bunch of guys Toy Zero plus are and didn’t want their international collectors to miss out. Toy Zero Plus have a few hand fulls reserved for you all you have to do is enter the online raffle. Full details below. 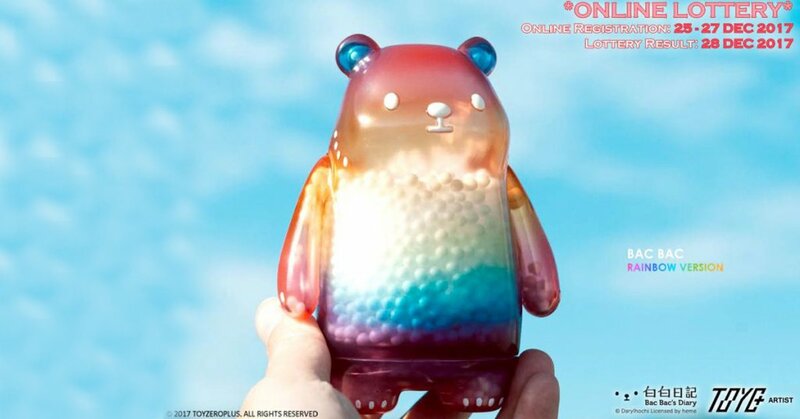 Designed by Darylhochi and produced by TOY0+, The translucent Bac Bac figure is painted by gradient rainbow colour, and filled with little snow particles. Limited to 100/pcs, Bac Bac Rainbow Version will be available through ONLINE LOTTERY, please register now from the link below, the list of successful applicants will be selected/drawn randomly via the computer system, the final result will be announced on 28th December 2017 through email. https://toyzeroplus.com/ for more info and vinyl ggoodness.